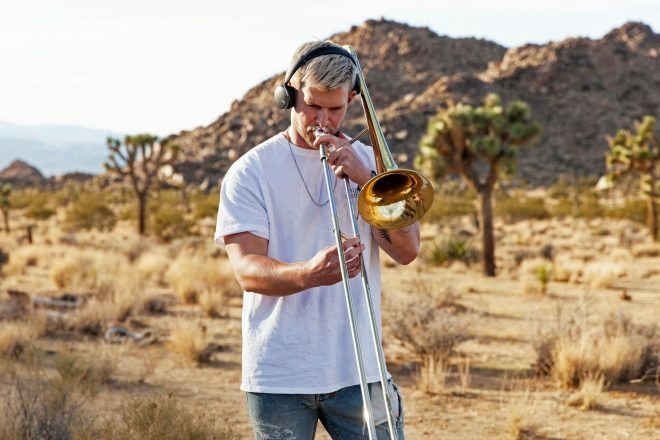 Jazz trombone trap artist Alexander Lewis has teamed up with KRANE for a new and imposing collaboration titled 'Sorbet Guts'. Packed with hard bass and rolling percussion, Alexander Lewis conducts this towering track using his trademark horn sound - a powerful style of production that's filled with screw-face goodness. Alexander Lewis recently joined Mixmag, AKG and a team of exceptional producers for a wholly unique electronic music retreat in Joshua Tree, California. With an emphasis on seclusion and artistic solidarity, Lewis hit the studio to explore new sounds and reflect on how electronic music has altered his creative output forever. Look for more info on this project coming soon. Alexander Lewis' 'OMNI. (Deluxe Edition)' is out now.